I like making things in muffin tins. (Exhibit A) I also like easy/healthy/filling breakfasts that I can eat on the go (Exhibit B). 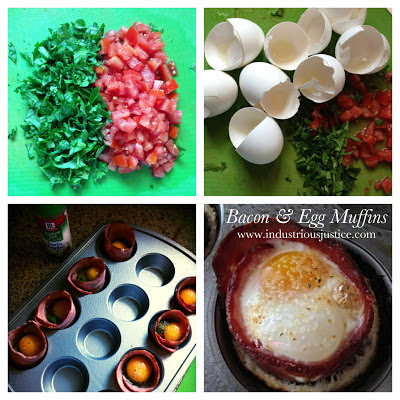 So when a friend posted a drool-inducing Facebook post about bacon and egg muffins, I quickly decided that I wanted to create a bacon, lettuce and tomato (BLT) version. These are good on their own but I think these would be even better topped with fresh avocado slices and a few drops of your favorite hot sauce. I think that avocado and hot sauce make most things better. Oh, and while you could use regular bacon, I opted for turkey bacon and still found them to be delicious. According to my calculations, each egg muffin, without toppings, is approximately 115 calories. Two of these are a perfect, substantial workday breakfast for me. Wrap a piece of bacon around the inside of each cup of the muffin tin. Divide the chopped arugula and diced tomatoes between the cups. Crack an egg into each cup (or pour in egg whites) and top with a pinch of garlic powder. Bake for 30-35 minutes or until eggs are set. Let cool slightly and then pop out muffins to eat immediately or pack up and refrigerate for a future grab-and-go meal. * If you use regular bacon, you will probably want to transfer the cooked muffins to paper towels to soak up some of the grease.